After our initial efforts of bringing people together to plan green spaces around Letsby Avenue we found that often the people who would turn up to meetings to plan green spaces were those that wanted changes to the status quo. In the case of our estate this was best characterised by those who wanted trees to be cut down or trimmed in order to get more light for their flats and gardens. This was also true to a certain extent about large areas of brambles that had taken over a large part of the shady garden. While some loved the wildness and the habitat it created, others complained that it was out of control. As the project continued, it became clear that there were other people who wanted the trees to stay. We encouraged these individuals who expressed differing views to convene a meeting or informal process to form a gardening plan for the space. However this was not successful; there was resistance from some people to getting involved in a community process, and there appeared to be a lot of sadness and „blocks‟ in this area. We tried to overcome this challenge by organising a short working session on a relatively small and overgrown area of the garden. The aim was to show that it was possible to improve this area, making it usable by both humans and wildlife. 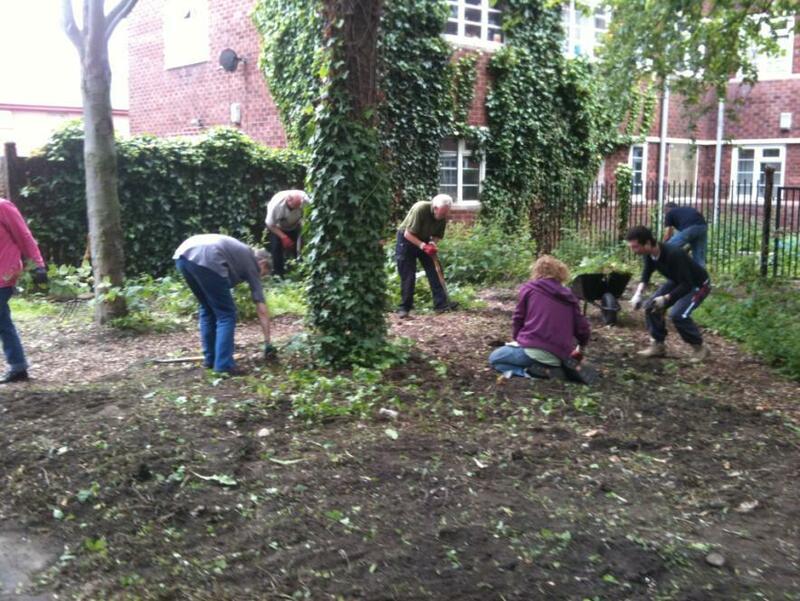 The Green Zone workers worked with the garden centre to Letsby Avenue in summer, at the start of the organise a work afternoon. We had a goal of clearing an area of brambles and to use this project activity as a way of creating discussion on what to replace it with based around ideas and a suggested planting plan prepared by Helene Rudlin from Hulme Community Garden Centre following previous feedback. 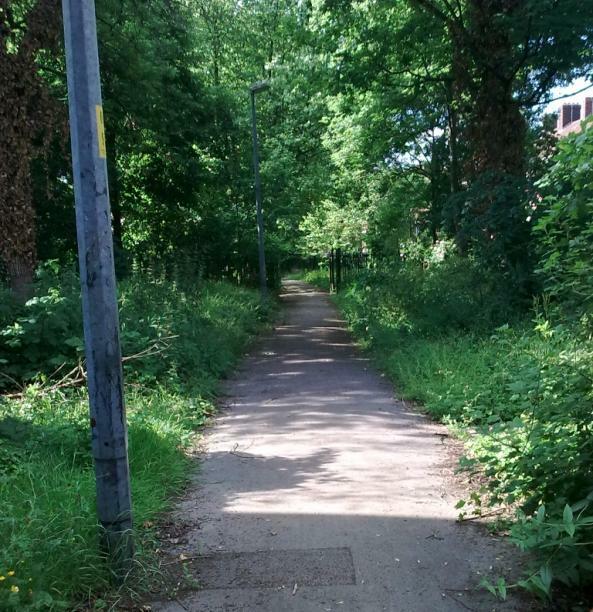 This plan was shown to the Grounds maintenance and neighbourhood team of the housing association who started the process by cutting and removing surface brambles. On the working afternoon, only a few people turned up in response to our publicity. However, a few more people came out of their flats to see what was going on as we started to dig out the roots of the brambles. One of us also did a bit of door-knocking, and we engaged residents as they were passing by. We soon found ourselves in an informal decision-making forum of around 15 people. People were viewing maps and colour printouts of possible plants and a plan which included adding a path to the area to make it easier to maintain and to enjoy. By creating this discussion forum and having a focus on the proposed plan, we seemed to overcome some of the blocks that had stopped us from moving forward. While most people were supportive of the plans, one resident was particularly resistant to change. Although he had no desire to use the space, he enjoyed because it was wild and spiky, friendly to animals and hard for people to hang out in. However, when he put across this point of view another resident said that that he would like his kids to be able to play in this area and be able to access the nature that was there. This direct and immediate feedback from a neighbour brought a new perspective and reduced the resistance to the changes. As it was happening, this process of mixing planning, action and discussion felt like a good way of overcoming blocks and inertia to restart community collaboration on an area.